The Nordic Broadway is the modern day garden office. Large glass to ground windows allows plenty of light into the building, while the large sliding doors provide optimum access. 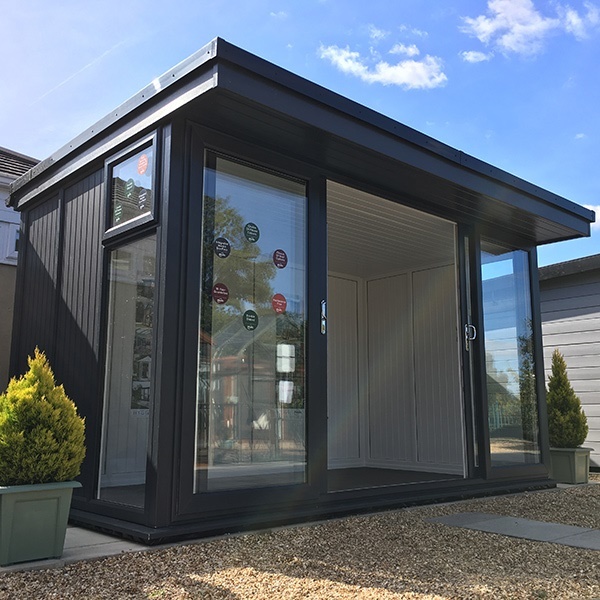 A contemporary, flat EPDM roof means the Broadway is an unobtrusive, yet striking addition to anyone's garden that will leave your neighbours envious! Like, its sister buildings the Manhattan and the Greenwich, the Broadway is built for warmth and comfort all year round, staying warm in the winter and cool in the summer. Delivery and installation of the Broadway is included. The Broadway creates a light, bright, inspiring space which will become your creative office environment. The security features that are a prominent feature of the Broadway, mean your equipment will be safe when you have finished for the day and take the short walk back to your home. Many of our customers need to run electricity to their building and if this is a key requirement for you, please dont't hesitate to speak to a member of our staff and we can guide you through the ways that this is achievable. Make the Broadway, your Broadway! With our range of customisation options, you can make the Broadway work for you. Choose from 4 colour options, add a choice of vinyl flooring to your building or even add a 4ft storage space for all your office valuables. The Broadway garden room is the perfect multi-function garden room, whether it's to entertain guests, dine with family and friends, relax and get away from the stresses of life or a harmonious place for you to work! 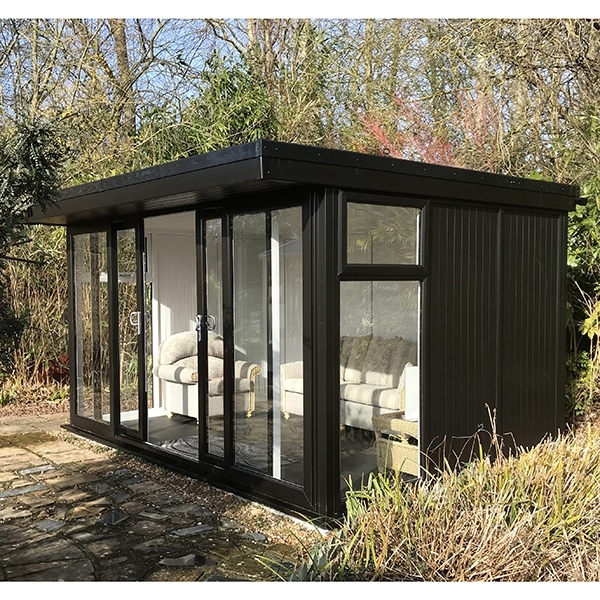 Maintenance-free and thermally efficient, our garden rooms will not rot or require painting. They will not shrink or expand like wood. The Broadway is designed with a ridge height of under 2.5m so that planning permission is only needed in special circumstances. Whether you want a white or a more traditional wood grain finish you have a choice of 4 colours. All colours include a white interior. Interior colour upgrade available on Golden Oak buildings. The Broadway offers a valuable 4ft wide storage section that is partitioned from the main building with its own external door. Quite handy if your Broadway is being used as a garden office, you can store materials, paperwork and supplies all neatly and securely hidden from view. 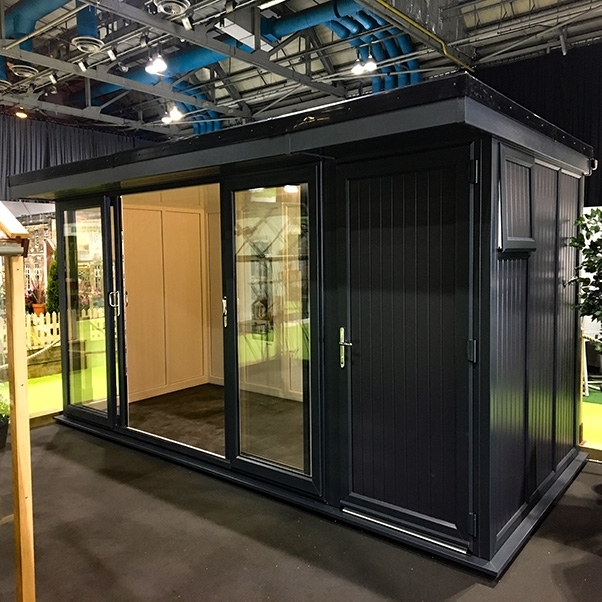 The fabulous Broadway : Garden Office, Hobby Room, or Lounge ... it's a versatile space for your garden which features the very highest standards of double glazing and insulation. Every Broadway is professionally installed to ensure your complete satisfaction. This attractive light oak finish is a new introduction for 2019. The Broadway is a very popular recent addition to our range in any case, and the new colour really sets it off to good effect. If you want to see this particular building you'll find it at our Woodford Park branch. 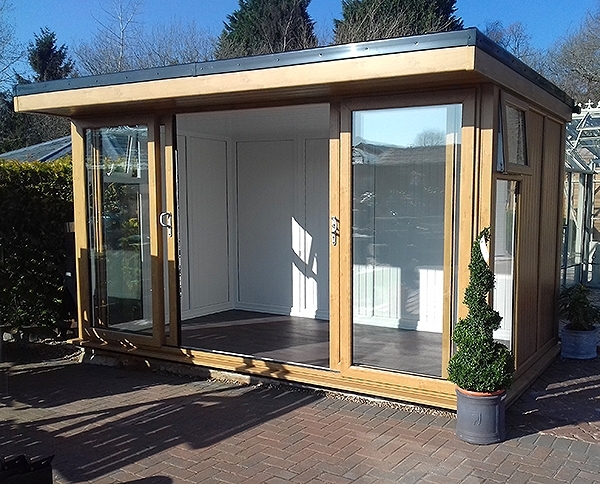 This stunning Nordic Broadway garden room is on display at our Southampton branch. Finished in the Grey optional colour upgrade, the Broadway is also available in Golden Oak and Black, as well as standard white. The large glass to ground windows fill the building with natural light, while the double sliding doors completely open up the front of the office, perfect for warm sunny days. 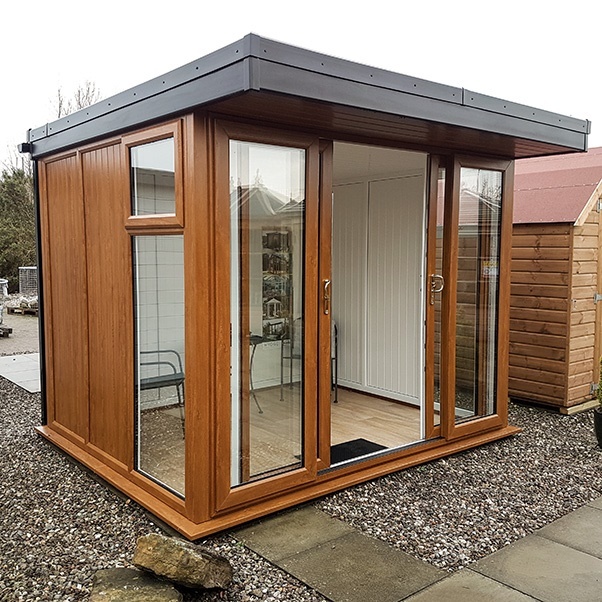 If you're looking for a more natural look to your Nordic Broadway garden room, then you could choose the optional Golden Oak colour upgrade as displayed here at our Dunfermline branch. A natural looking colour with a faint woodgrain effect, it perfectly mimics the appearance of natural timber with none of the maintenance! Also, if your property has similar windows and doors, this colour upgrade will blend in perfectly with your home. 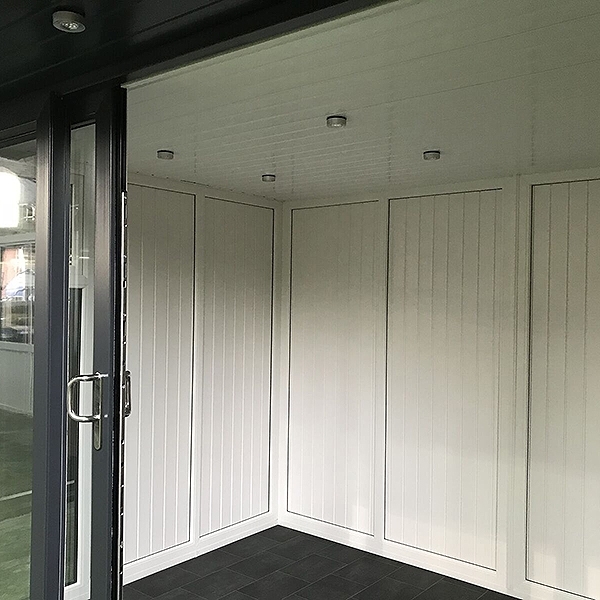 If you need a storage area for your garden building, then you're in luck! The Broadway and it's sister building, the Greenwich both offer an 'add-on storage space' section. This can be on either the left-hand or right-hand side of the building. The building as pictured was featured at on of our 'show exhibits' last year and came in very handy for storing supplies of brochures and wine! The Broadway is attractively finished inside with maintenance free white PVCu cladding. This is easy to keep clean and maximises the light. Talking of light, you'll notice that there are interior lights fitted, with hidden wiring behind the roof sheets. The lights aren't part of our package but with a bit of co-ordination with a professional electrician, this can be relatively easily done. Where Can I See Nordic Garden Buildings Garden Offices?